An irritating distraction or the freedom to relive a concert experience? A new study shows that up to 73% of Aussie music punters would support requests by performers and venues for patrons not to take photos and videos at events. More than half (53%) say they want fewer photos and videos taken at events, and close to a quarter (23%) would support a complete ban. Nevertheless, there seems to be a difference between what some punters expect from others and what they do themselves. 46% of the 629 surveyed in January admitted to regularly taking photos or videos – and more than one-quarter (26%) felt as though they often missed out on enjoying a performance or experience because they were too focused on recording it. * Women are more likely than men to take photos and videos at live events (55% vs. 37%). * Men (58%) and those belonging to Gen X (52%) are most strongly in favour of banning mobile phones at events. Phil Silverstone, Melbourne-based general manager of Eventbrite Asia Pacific, said this morning that Aussies are increasingly growing frustrated by punters jostling for the perfect photo. 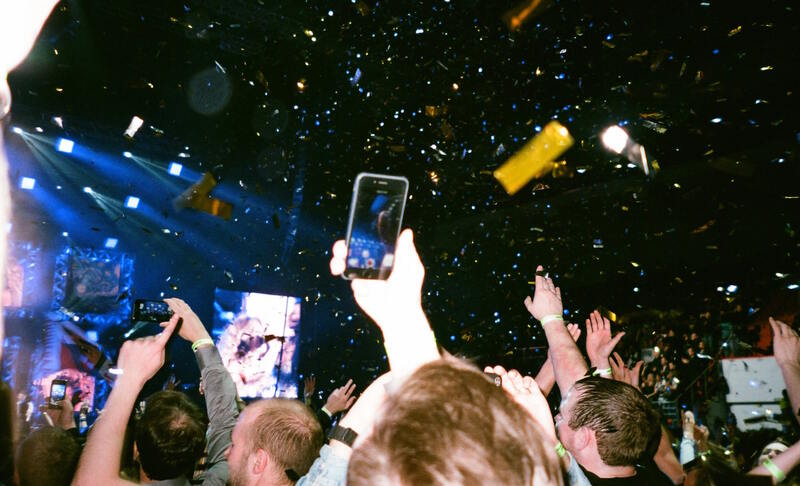 “When it comes to live performances, it’s no longer enough just to say, ‘I was there’ – you need the photo, video or social media post to prove it. More local fans are being told that such behaviour is uncool. “Very selfish … (and) very inconsiderate of the other punters” is how Melbourne Cherry Bar’s owner James Young described it when he slapped a ban at the hard rock venue last year. More recently, Jack White introduced ta ban to his Australian shows. Fans were able to leave their mobiles locked in their cars or sealed in a portable pouch provided at the door. In the past, he has tried to accommodate those who want to relive the live experience by posting photos from his shows on his website which fans can download and share. Among those using the pouch (and others like it) have been Bob Dylan, Guns N’ Roses, Alicia Keys, The Lumineers, and comedians like Chris Rock and Dave Chapelle. Others like Bonnie Raitt who talk about the “sacred space” between her and her fans, ask them to wait until her final song to take photos. Yondr is also operating in Australia, where it is also working with schools to stop distractions during lessons. Last month Australian comedian Hannah Gadsby introduced the Yondr pouch idea for her new show Douglas. “I have autism and the use of phones during a show is a very distressing distraction for me when I’m performing,” she explained in a tweet.